Through my ambassadorship with ZOOMA, I received a Handy 10 water bottle from the nice people at Ultimate Direction. I’ve had a chance to carry the Handy 10 on a few of my runs, so I thought it was time to do a review of the product. During my longer runs, I’ve always just carried a regular plastic bottle of water with me, which wasn’t the most comfortable thing to hold while running. I really wasn’t sure that I would like this Handy 10 bottle any better than what I’d been carrying, but I was wrong. It fit perfectly in the palm of my hand and was very comfortable to hold onto. The adjustable hand tension strap allows you to set it as tight or loose as you want. I also love the fact that it has a zipper compartment to store things like gels, keys or whatever you want to take with you. Oh, and just in case you are wondering, their plastic water bottles are BPA free. 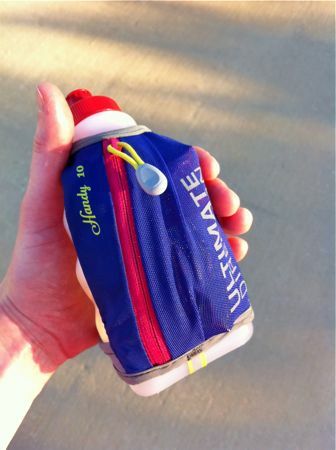 I think that the Ultimate Direction Handy 10 is a great water bottle for runs between 5-9 miles. For longer runs, their Handy 20 might be a better option. Disclosure: Ultimate Direction provided me with a free water bottle, but all thoughts and opinions are my own. Do you have a favorite handheld water bottle? By Tempie at April 8, 2014 .